Ask The Protein Powder Chef: Do You Have A Recipe For Protein Chocolate Chip Cookies? I love chocolate chip cookies. I've followed a lot of recipes for protein cookies online, but they all turn out dry and rubbery! 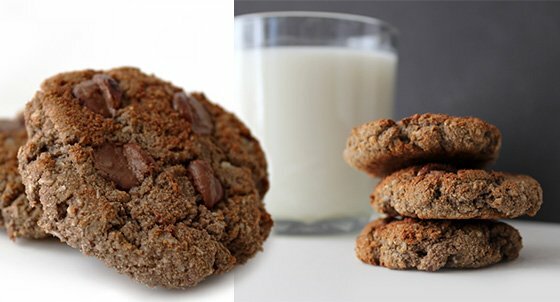 Is there a way to make high-protein, sugar-free cookies actually taste good? Please say yes! Thank you for your question! Ever since I started my blog two years ago, I've been experimenting with protein cookies. I've gone through dozens of trials and made many errors, creating batch after batch of "dry and rubbery" cookies like the ones you described. I didn't give up, though; I just took notes and kept on trying! I tried different ingredients, different protein powders, and different cooking approaches until I was able to separate what works from what doesn't. Make sure your mixture is no more than 1/8 protein powder, especially if you use whey. Otherwise, the whey will cook and your cookies will turn out rubbery and weirdly bread-like. You need to have some fat in your batter. Egg yolk, nut butter, and coconut butter all work great. Nuts and flaked coconut are a great way to add both crunch and flavor without adding sugar or carbs. These guidelines aren't the "end all, be all" of protein cookie-making, but I think they represent three really important guidelines to remember. OK, enough chit-chat. Let's bake!